Computer Sciences Corporation (CSC) provides IT services, including cloud storage and security, for public and private sector clients. In 2015, CSC generated 31 percent of its total revenue from the U.S. federal government, amounting to $3.77 billion. CSC merged with SRA late in 2015; it is sometimes referred to as CSRA. According to the Computer Sciences Corporation (CSC) web site, the company was founded in "April 1959 by Roy Nutt and Fletcher Jones, both in their late 20s, ... with $100 and a contract from Honeywell to develop a business-language compiler called FACT. Formerly with United Aircraft Corp., Nutt had developed the first widely accepted assembly program, called SAP, and had been a member of the small IBM team that had developed FORTRAN. Jones came from North American Aviation Corp., where he had managed a divisional computer center. A CSC executive sits on the board of the Professional Services Council (PSC), a trade association. PSC is a major opponent of the Fair Pay and Safe Workplaces Executive Order, an order issued by President Obama in 2014 that aims to ensure that federal contractors comply with federal wage laws, health and safety standards, and civil rights laws. 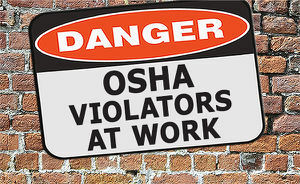 An investigation by the Center for Media and Democracy of OSHA inspection records found that numerous corporations (and/or their subsidiaries)--including CSC--whose executives sit on the board of PSC had been cited for serious and repeat violations of OSHA standards from 2013-2015 that would be reportable under the EO. A "serious" violation indicates "a substantial probability that death or serious physical harm could result" from a hazard, a "willful" violation is cited when "evidence shows either an intentional violation of the Act or plain indifference to its requirements," and a "repeat" violation indicates the business "has been cited previously for a substantially similar condition." In 2015, CSC generated 31 percent of its total revenue from the U.S. federal government, amounting to $3.77 billion. As described in more detail below, between 2013-2015, CSC had 3 "Serious" and 4 "Other-than-Serious" citations from OSHA and penalties of $8,440. 05/08/2014: At a site in Hanover, MD, Computer Sciences Corporation was cited for 1 "Serious" and 4 "Other-than-Serious" violations and fined $2,040 after an investigation following an accident involving the control of hazardous energy, known as the "lockout/tagout" standard. The company failed to provide protective materials and hardware that would isolate, secure or block machines or equipment from energy sources. 05/28/2014: Subsequent to the accident investigation at the same site, the company was cited for an additional "Serious" violation and fined $1,500 for violation of the "General Duty" requirement. The following cases would not trigger specific action under the Executive Order as they occurred outside its three-year look-back period. They are included here because the standards violated are closely related to those involved in the more recent cases, and to give an indication of the company's overall record of compliance with the laws covered by the order. 03/12/2012: and 3/22/2012 In response to a complaint at a site in Fayetteville, NC, Computer Sciences Corporation was fined $10,500 after being cited for 3 "Serious" and 4 "Other-than- Serious" violations related to asbestos exposure, including failure to train employees to use personal protective equipment; to maintain, inspect, or test protective equipment; and to develop, implement, or maintain a written hazard communication program. Ten days later, in response to a complaint, the company received another "Serious" violation and was eventually fined $5,600 for failure to provide training for employees who face a risk of electric shock. 04/06/2011: In response to a complaint at Nellis Air Force Base in Las Vegas, Computer Sciences Corporation was cited for 2 "Serious" violations and fined $6,300 for failing to protect workers against occupational exposures to hexavalent chromium, a cancer-causing substance. 12/11/2014: OSHA ordered Computer Sciences Corp. to pay $186,000 to two employees whom the company improperly laid off for raising nuclear safety concerns about the Hanford nuclear facility, in violation of federal whistleblower laws. The employees reported a defective electronic medical records system that had problems tracking medical restrictions. Consequently, workers medically restricted from certain jobs or areas with beryllium could be exposed. Beryllium, a metal once used at the facility, is a cancer-causing substance. 9/21/2015: Subsequent to this finding, on September 21, 2015, the U.S. Department of Energy (DOE) Office of Enterprise Assessments' Office of Enforcement notified Computer Sciences Corporation of its intent to conduct a worker safety and health investigation into the safety concerns that were expressed by the two former employees regarding an electronic medical record system that was being implemented by CSC at DOE's Hanford site. The DOE Office of Enforcement also notified CSC that it is considering taking enforcement action for substantiated retaliation against those two former CSC workers for raising the safety concerns. Neither of these cases would trigger specific action under the Executive Order, as they relate to workplace laws not covered by the Order. They are included to give an indication of the company's compliance with other important workplace laws and because they occurred on a sensitive federal contract with the Department of Energy. "Assembling a small staff of talented people, CSC soon gained a reputation for innovative design and high-quality work. With Nutt providing the technical direction and Jones handling the marketing, the young company prospered. Through its work for numerous computer manufacturers and other large computer users, CSC developed more systems software than any other computer services company in the industry. "CSC went public in 1963 and was listed the following year on the Pacific and American stock exchanges, becoming the first software company to be listed on a national exchange. Five years later, the company again brought new stature to the emerging software/services industry by being the first software company to be listed on the New York Stock Exchange. "By 1964, annual revenues totaled $4 million and employees numbered 230. At this point, the founders - joined by William R. Hoover, who would eventually become CSC's chairman and CEO - made a series of decisions that changed the nature of the company and launched its rapid growth. "The three executives decided to expand CSC's markets by serving users, rather than manufacturers of computers. They determined that CSC could provide users with technical services to support the development and operation of computer-based information systems. "CSC decided to focus on the largest computer user of all, the U.S. federal government. At the same time, anticipating that computers and communications would converge, CSC bought two ITT divisions engaged in communications systems engineering and systems management for the U.S. Defense Communications Agency, communications utilities and other clients. The acquisition gave CSC extensive capabilities in the design and development of communications-based computer systems. By focusing on expanding the company's capabilities in new technologies and understanding customers' requirements, CSC quickly became a major supplier of information technology (IT) services, a leading integrator of computer and communications systems, and a premier developer of custom software. It also became, and remains today, one of the largest computer-services companies in the U.S. federal government market. "In the mid-1980s, CSC's management saw strong new commercial markets emerging for its services in the areas of systems integration and the management of computer and communications facilities. Competitive pressures to improve quality and service, get products to market faster and control increasingly larger IT operations were forcing many corporations to look for help in making their information systems more supportive of corporate objectives. "CSC's longstanding culture of client collaboration and flexibility helped fuel its internal growth. In addition, CSC initiated an aggressive acquisition program to supplement internal growth and rapidly establish a strong presence in the U.S., European and Australian markets. "The early 90s marked CSC's entrance into the IT outsourcing market with the award of a $3 billion contract from General Dynamics - one of the first and largest outsourcing awards in the industry. Since then, the company has expanded its outsourcing offerings to include Web and application hosting and business process outsourcing in a wide array of industries such as financial services, healthcare, chemicals and consumer goods and services. "Today, Van B. Honeycutt is CSC's chairman and chief executive officer. He joined the company in 1975 and has been a corporate officer since 1987. He has played a major role in advancing CSC's position in the commercial market, particularly in the areas of e-business and IT outsourcing. "CSC has transformed the $100 with which its founders established the company into annual revenues of $11.3 billion and approximately 90,000 employees in locations worldwide. "The company, now a member of the Fortune 500, offers an unparalleled scope of services ranging from consulting in the strategic uses of information technology, to systems design, development and integration, to outsourcing. And yet, while much has changed about CSC throughout its 40-year history, one constant has remained: CSC's laser-like focus on working collaboratively with clients to develop the most innovative technology solutions that meet their business needs." Also see News and Events Calendar, which contains news releases detailing CSC's extensive defense and federal contracts. ↑ Computer Sciences Corporation, "SEC Filings," financial statement, accessed January, 2016. See 2015 10-K.
↑ Occupational Safety and Health Administration, "Inspection: 317772051 - Computer Sciences Corporation," inspection case record, accessed January, 2016. ↑ Occupational Safety and Health Administration, "Inspection: 317554665 - Computer Sciences Corporation," inspection case record, accessed January, 2016. ↑ Occupational Safety and Health Administration, "Inspection: 317554665 - Computer Sciences Corporation," inspection case record, accessed January 2016. ↑ Occupational Safety and Health Administration, "Inspection: 315966283 - Computer Sciences Corp," inspection case record, accessed January, 2016. ↑ Occupational Safety and Health Administration, "Inspection: 315966069 - Computer Sciences Corp," inspection case record, accessed January, 2016. ↑ Occupational Safety and Health Administration, "Inspection: 314889890 - Computer Sciences Corporation," inspection case record, accessed January, 2016. ↑ National Institutes of Health, National Cancer Institute, "Hexavalent Chromium Compounds," fact sheet, March 20, 2015, accessed January, 2016. ↑ Occupational Safety and Health Administration, "Hanford nuclear facility contractor ordered to pay 2 laid-off workers $186K in wages, damages for retaliation," press release, December 11, 2014. ↑ National Institutes of Health, National Cancer Institute, "Beryllium," fact sheet, March 20, 2015, accessed January, 2016. ↑ U.S. Department of Energy, Office of Enterprise Assessments, "Enforcement Notice of Intent to Investigate, Computer Sciences Corporation," press release, September 2015, accessed January, 2016. ↑ Officers, Computer Sciences Corporation, accessed February 2008. ↑ Michael W Laphen, Forbes, accessed February 2008. ↑ Hayward D Fisk, Forbes, accessed February 2008. ↑ Michael E Keane, Forbes, accessed February 2008. ↑ Paul T Tucker, Forbes, accessed February 2008. This page was last edited on 31 March 2016, at 15:24.